On Wednesday 24 January 2018, 35 herders were sentenced to serve lengthy imprisonments, between 6 months and 5 years, by the People’s Court of Zaruud Banner, in Southern Mongolia. The mass trial occurred after a 6-month detention that the herders faced for staging and participating in demonstrations. One of their major protests was against the Xu’s family, which controls the area and illegally occupies the herders’ field. Herders have been charged of “provocation and causing disturbances” and “gathering to assault state organs”. The defenders denounce the trial as an effort to please the Xu family and Chinese authorities in general, by criminalizing protesters to prevent any form of resistance. The remaining 26 were sentenced to 6 months in jail, but were released because they had already served 6 months of detention before the trial. 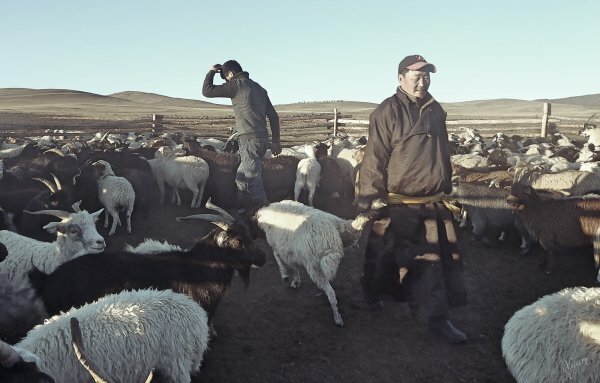 Other herders from the Bayan-Tumen Gachaa told the SMHRIC that the trial was highly unjust and the court decision was made in favor of the interest of Chinese settlers, in particular a Chinese family surnamed Xu. “The Xu’s, a poor Chinese family from the famine-stricken province of Anhui, came to our Bayan-Tumen community in the 1960s. The couple had two sons when they arrived here. Soon, they had five additional sons and multiplied exponentially. Today, the Xu’s population reached 280. With their large family network and amassed wealth, they are not only controlling the key economic sectors but also manipulating local government, police and courts of Zaruud Banner through bribing. One of the major protests that the herders launched was against the Xu family run road construction company that illegally occupied the local herders’ grazing land. The trial of 35 herders is an effort of the local authorities to accommodate the Xu’s demand to criminalize the protestors to prevent any further resistance from taking place,” the herders said in a written statement to the SMHRIC. “In May 2017, defendant Mr. Bai along with other villagers drove to the construction site of the interstate highway 208 between Ulzeimurun Sum and Lu Bei township to block the traffic,” the Zaruud Banner TV News reported. “The Public Security Bureau police dispatches arrived to the scene and summoned Mr. Bai and Mr. Tsetenbat to the Ulzeimurun Police Dispatch Station. Defendants Ms. Jin Haixia and Mr. Wu Tiedan rallied the people via WeChat to come to gather illegally in front of the Police Dispatch Station to urge the release of the detainees. “They staged a demonstration of protest and picketing in front of the Police Dispatch Station for 15 hours, disturbing the state organ’s work order, causing an adverse social effect, and violating the state laws,” the TV news continued. Relatives and family members of the 9 imprisoned herders said they are denied to right to visit them in prison. Their health conditions and whereabouts remain unknown.